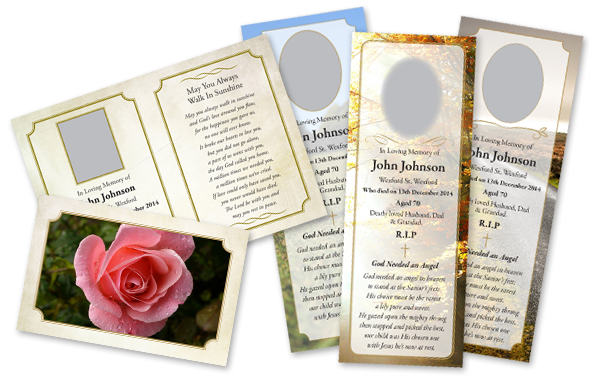 At Think Memorials we specialize in personalised laminated memorial tribute and remembrance cards which are a lasting and befitting tribute to your loved one. Our Memorial Cards and Bookmarks are printed on 350gsm white card with a glossy laminated finish. The full colour personalized bookmarks come with a photo of your loved one and your choice of verse/verses. Choose any card or bookmark you like from our collection and fill out the online form or call us on 053 9180094 to order your personalised memorial cards or bookmarks. Remembering Our Loved Ones - Personalised Cards and Bookmarks. © 2018 Think Memorial. All Rights Reserved. Website by Think Websites.